New Delhi: Wholesale prices increased the most since May, highlighting the inflation risks that prompted the central bank this week to begin withdrawing record monetary stimulus. The benchmark Wholesale Price Index (WPI) rose 1.51% in the week to 17 October from a year earlier, after gaining 1.21% in the previous week, the commerce ministry said in New Delhi on Thursday. “A recovery in growth and faster inflation will force India to also raise its benchmark interest rates starting January," said Chetan Ahya, an economist at Morgan Stanley in Singapore. “We see this rise in policy rates as a move toward normalization rather than tightening that hurts growth." Subbarao this week increased the statutory liquidity ratio to 25% from 24% and raised the central bank’s inflation forecast for the year to March to 6.5% from 5%. RBI has kept its benchmark interest rates unchanged, even as Subbarao said the bank would need to exit its accommodative policy settings in a calibrated way to ensure that while the recovery process is not hampered, inflation remain anchored. Wholesale prices have risen for seven straight weeks after declining for three months. Consumer price inflation is running above 10%. Consumer prices paid by farm workers jumped 13.19% in September from a year earlier and those paid by industrial workers climbed 11.72% in August. Food prices are rising as the weakest monsoon rains since 1972 hurt farm output, causing shortages. Potato prices increased 97.7% and onion prices climbed 45% in the week to 17 October from a year earlier, Thursday’s report showed. Costs of lentils rose 22.9%, sugar gained 45.7% and milk, 10%. Costs of petrol, edible oils and metals declined. The WPI published on Thursday may be revised in two months. 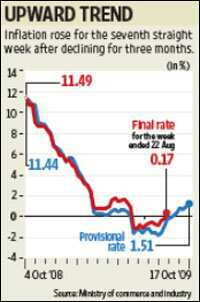 The ministry revised the rate for the week ended 22 August to a rise of 0.17% from a decline of 0.21%.